The Likert scale is a great way to collect data based on a five, seven, or nine-point rating scale. Rensis Likert (pronounced “lick-urt”) invented the scale as a scientific method to measure attitudes. 1. Login to your Polldaddy dashboard. 2. Select “Create a new survey” under the Surveys dropdown menu. 3. Give your survey a name and click on the blue “Save” button at the bottom of the page. 7. Once you’ve got your wording just right, click on the blue “Done Editing” button at the bottom of the page to see what your survey design looks like. If you need to tweak it, click on the “Edit” button. If you’re ready to release your survey into the wild, click on the blue “Finish & Embed” button on the top right hand of the survey design area. You can embed your survey as a pop-up on your website, embed it inline as part of your website content, create a direct link to the survey you can use anywhere you wish, collect responses via your Ipad or set up an e-mail list and send it out via e-mail to your participants. Do you know how to get it to appear on an iPad screen without making people scroll over? Hi Greg, I don’t understand what you mean. Can you contact support with a link to the survey? 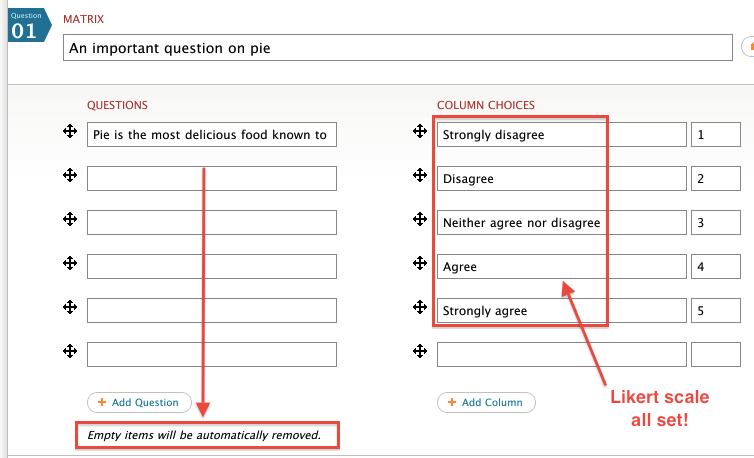 Hi Adam, you can add more columns by clicking on the +Add Column button while editing the Matrix / Likert question. Yeah, I tried that yesterday, didn’t work. But this morning it worked, thank you ! Thanks for your kind words–we really appreciate it! It’s great and so intuitive to use.. I created a survey before reading the instructions and it worked out fine!